Bright Starts Teething Fun Gift Set Just $7.88! Down From $18.61! You are here: Home / Great Deals / Bright Starts Teething Fun Gift Set Just $7.88! Down From $18.61! Right now you can get this Bright Starts Teething Fun Gift Set for just $7.88 (Reg. $18.61) at Walmart! These lovable characters are the perfect way to soothe baby’s sore gums! The Bright Starts Teething Fun Gift Set features 4 fun toys. The Snuggle & Teethe giraffe is a cuddly companion with crinkle in his belly and soft plastic teether feet. The Rattle & Shake Barbell is easy for little hands to hold and makes fun rattle sounds. 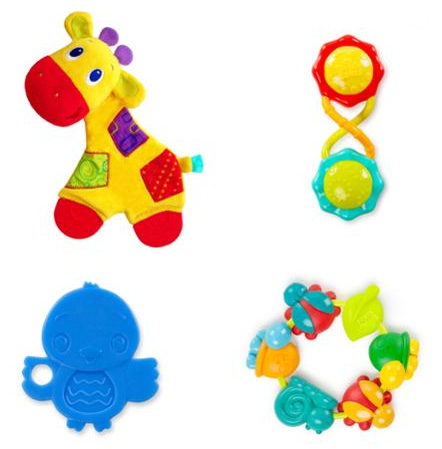 The blue bird teether and Buggy Bites Teether offer plenty of textures for teething relief and baby is sure to love the colorful characters. Fun comes first! Snuggle & Teethe? Giraffe has plush body, crinkle belly and teether feet!